Note: Google+ Photos will be retired starting July 29, 2015. 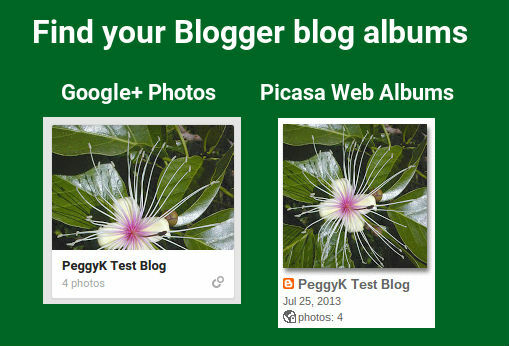 You will still be able to find your Blogger albums in Picasa Web Albums after that date (as of 11/19/15 Google+ Photos links redirect to Google Photos). Picasa Web Album note: albums currently only display up to 1000 images, but can hold up to 2000 images. If you post a lot of images to your blog, they may not all be visible. Don't panic! They are still there. Do you know where your Blogger blog's image albums are stored? You can find them in your Google+ Photos or Picasa Web Albums, Google Album Archive (get.google.com/albumarchive), but not your Google Photos. You probably won't ever need to access your blog's images, but knowing where they are will help you ensure you won't inadvertently delete them. The images for your blog are stored in a special photo album for your blog in your Google account. The default privacy setting is that "anyone with a link" can access the blog album. The album is not visible to the public. Do not make your blog's photo album private! Do not delete the images in your blog's photo album! Any changes you make to your Blogger blog's photo album can make the images on your blog disappear. And if your blog's images are important to you, use Google Takeout to back up all your photos today! What about Google Photos (no plus!)? Note: Google+ Photos will be retired starting July 29, 2015. You will still be able to find your Blogger albums in Picasa Web Albums after that date. You can find your Blogger blog album in two places in Google+, the Photos tab of your Google+ Profile and on your Google+ Photos Albums page. The album is not labeled as a Blogger blog album. Remember the album in Google+ Photos is only visible to you when you are signed in to your Google account. Your blog album must either be Public or visible to anyone with the link for the images to display on your blog. Here is how you can tell in your Google+ Photos settings. Note: Picasa Web Albums will be retired August 1st. You can find your Hangout photo albums in the new Google Album Archive (get.google.com/albumarchive). (Learn more). It is not possible to change the album visibility. Note: beginning July 29, 2015, Google+ Photos will be retired. After that date you will still be able to find your Blogger blog albums in Picasa Web Albums. Learn how to change the album visibility settings in Picasa Web Albums. Click the Album title to view the images and check the Google+ sharing settings in more detail. 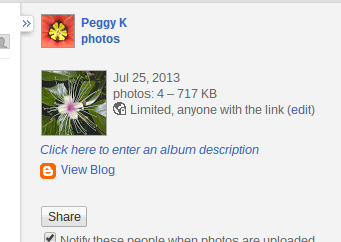 Below the blog album's title click "Shared privately"
The Album properties window will pop up. "Share via link" should be enabled. Do not remove or change this link. If you have made blog's album private or removed "Share via link", you must make the album public for the images to re-appear on your blog. To make your album public, add Public in the "Visible to" box in the Album properties. Note: Picasa Web Albums will be retired August 1st. You can find your Hangout photo albums in the new Google Album Archive (get.google.com/albumarchive). (Learn more). Google Album Archive does not have trash recovery, so consider carefully before deleting any images! Note: Google+ Photos will be retired starting July 29, 2015. 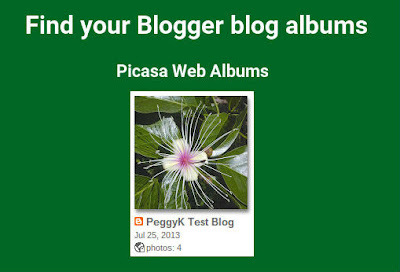 You will still be able to find your Blogger albums in Picasa Web Albums after that date. Picasa Web Albums does not currently have trash recovery, so consider carefully before deleting any images! 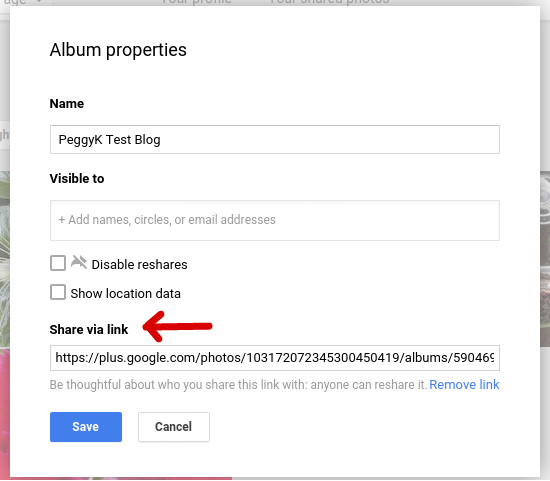 As of November 19, 2015 Google+ Photos links redirect to Google Photos. There is no way to access your deleted Blogger blog photos. If you have inadvertently deleted your blog's images, you have 60 days to recover them from the Google+ Photos trash. 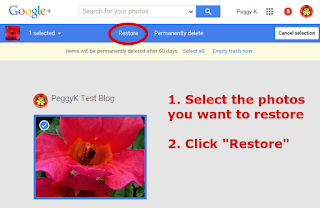 Your deleted blog images will not appear in Google Photos trash. 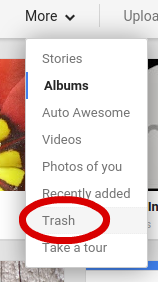 When you are viewing Google+ Photo albums, click More at the top of the screen, then select Trash from the menu. Photos in the Trash are grouped by the album they were deleted from. Select your blog's images, then click Restore on the blue bar at the top of the screen. The restored images should automatically re-appear on your blog. Note: Picasa Web Albums will be retired August 1st. You can find your Hangout photo albums in the new Google Album Archive (get.google.com/albumarchive). (Learn more). If you do not have a Google+ Profile, or want to use a simpler interface, you can view your Blogger blog's album in Picasa Web Albums (picasaweb.google.com/lh/myphotos?noredirect=1). Google+ Photos is being retired (starting July 29, 2015), which means that Picasa Web Albums will be the only way to view your albums after that date. 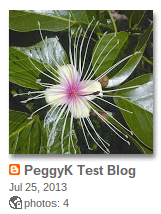 Picasa Web Albums adds a Blogger icon to Blogger blog albums for easy identification. Are some of your blog images missing from the Blogger blog album? Don't Panic! Picasa Web Albums can currently only display a maximum of 1000 images, but the albums can hold up to 2000 images. As long as the images are displaying in your blog posts, they are still there. Click the album title to view and change the visibility settings. Click (edit) and the Edit album information box will open, with the Visibility settings at the bottom. Click the Visibility menu to make your blog's album Public. Do not change the Visibility from "Limited" to "Only you"! This will make the images on your blog disappear. Picasa Web Albums (and the new Google Album Archive) does not offer any means to recover deleted photos. What about the new Google Photos? 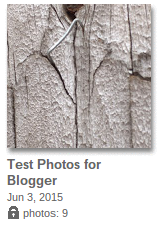 The new Google Photos (photos.google.com) does not display Blogger blog albums. The only place you will find your Blogger blog album is Google+ Photos and Picasa Web Albums. the new Google Album Archive (get.google.com/albumarchive). (Learn more). You can add photos auto-backed up to Google Photos to a blog post using the "From your Phone" option in the Blogger post editor. Is there any way of recovering the "share via link" or create one to match the existing images on a blog? TimMee Army: no, there isn't any way to re-create the original "share via link" links. So if you made the album private, the only way to get the images to re-appear is to make the album public. If you changed it to "anyone with a link" a new special link would be created, different from the original link. Thanks for the info, Peggy. I'm a little confused about the public, private thing. The images are already on the blog so doesn't that make them public by default? It's sort-of complicated. The images are visible to the public on your blog, but - by default - the album the blog images are stored in is not visible to the public in Picasa Web Albums or Google+ Photos. That means people browsing your photo albums using either of those interfaces won't see it. The images are only visible to the public on your blog. If you make the album "private" or visible to "only you", no one but you can see the images. That means they will disappear from your blog. 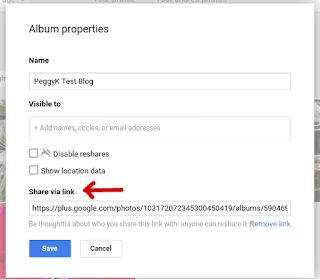 And if you make the album "public", anyone can see your blog's photo album when viewing your albums on Google+ Photos or Picasa Web Albums. The trick is that if you made your Blogger blog album private, the only way to get the photos to reappear on your blog is to make the album public. If you don't mind people seeing the album when they view your Picasa Web Albums, then that's no big deal. 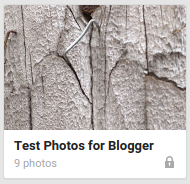 My Blogger photos are the default "limited, anyone with the link" in Picasa Web Albums. 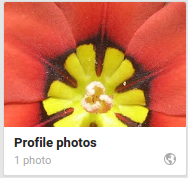 So this means they will show up on Google+ profile when I am signed in, but will not show on my Google+ profile for anyone else? 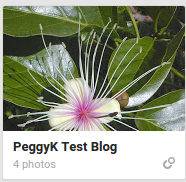 Yes, that's right, only you can see your Blogger blog images on your Google+ Profile Photos tab. Thank you, Peggy. Your blog is very helpful. Hi Kate, I'm glad to hear my post helped you out! I looked at a travel blog I worked on all last summer. The last time I was there, all of the photos were there and everything was good. Now, 80% of the pictures are gone. 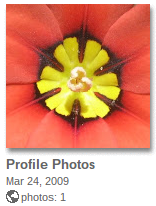 I went to the Picasa blogger album using the link you posted and there's only 30 photos in the album (out of nearly 300). Where did the other photos go?Those 30 pictures from the Picasa allbum are the only ones that are showing up in the blog. There's no sign of the other 270 pictures. Please help! Hi Krista, I'm sorry to hear your photos are missing. The only way they could have disappeared is if you deleted them, unfortunately. They are visible on your own Google+ Profile, so you could have inadvertently deleted them there. You can try checking the Google Photos trash (photos.google.com/trash), but Blogger images aren't usually accessible there. And Picasa Web Albums unfortunately doesn't have a trash bin. I'm sorry I don't have any good suggestions for you. Thank you Peggy! I deleted my photos from google+, not realising that it would also delete them from blogger. So pleased someone directed me to this post! I've just read that Google is retiring Picasa Web Albums, stating that "all photos will be found in Google Photos". That's obviously not the case for Blogger photos. Do you have any idea what will happen to those? Maria: Good question! The announcement mentioned " for those of you who don’t want to use Google Photos or who still want to be able to view specific content, such as tags, captions or comments, we will be creating a new place for you to access your Picasa Web Albums data". My guess is that is where the Blogger albums will be. I'm wondering about this too. It sounds as if Picasa Web Albums will simply be read-only, so no new Blogger-uploaded photos will appear there? It would be much simpler to just make Blogger albums visible inside Google Photos. So far, they haven't done so. Ah, this is interesting. Although I can't find my Blogger albums in the actual Google Photos site, I *can* see them all inside Google Drive if I enable the "Google Photos" folder. Following this discussion with great interest. Currently moving material from http://www.praguestory.com to new site at http://pragitecture.eu, and wondering what will happen to my old Picasaweb/Blogger albums. Would love to have access via Google Photos. Please keep me updated! Hi John, your Blogger blog album is in Picasa Web Albums (picasaweb.google.com). It is not currently available in Google Photos. Is there any way to save the photos on my Picasa Web Album to my computer? I know I can do it manually by clicking on each picture and then downloading, but that will take forever! Is there any way to do all, or at least a large batch of them at once? 5. You can *Include all photo albums* or *Select photo albums* - your Blogger Blog and Hangouts photos albums will be included. 9. Once the archive is ready, Google will send you an email to the download page where you can download the zip file with all your photos. Thanks. Out of my searched websites, this is one which gave the correct and up to date information on my query.